Following the Port Everglades Expressway in South Florida, Interstate 595 connects I-75 and the Sawgrass Expressway (SR 869) at Sunrise with Florida’s Turnpike at Davie, and I-95 and U.S. 1 between Fort Lauderdale and Dania Beach. Interstate 595 overlaid the original alignment of SR 84. The segmented state road remains in service along the Port Everglades Expressway frontage road system west of Marina Mile Boulevard in Fort Lauderdale. East of U.S. 441 & SR 7, SR 84 diverges from I-595 to end at U.S. 1 south of Downtown Fort Lauderdale. 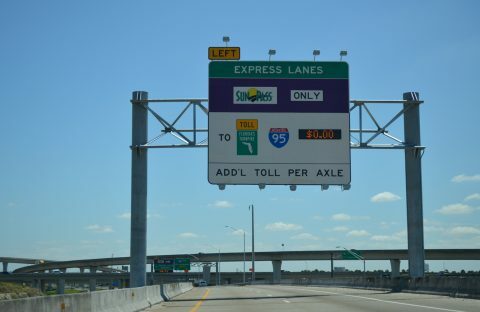 Wrapping up in 2019, the I-75 Express Lanes Project added 15 miles of toll lanes to the southernmost portion of Interstate 75. Segment E of the project added a flyover ramp from the I-595 Express Lanes westbound to I-75 south. Work on the northernmost section of the I-75 Express Lanes cost $75 million and ran from March 2014 through late 2017. Ramps from Interstate 75 south and SR 84 east combine to form the I-595 Express Lanes eastbound. A third ramp adds traffic originating from both I-75 north and SR 869 south from the I-595 mainline further east. Photo taken 04/01/14. Two reversible lanes run along the middle of Interstate 595 from the systems interchange with I-75 and SR 869 east to I-95 at Fort Lauderdale. Separated from the general travel lanes by concrete barriers, the managed lanes operate with limited ingress and eggress points and a 70 mile per hour speed limit. Split into five separate projects, the I-595 Express Lanes were built between June 2010 and March 26, 2014. Tolls are collected electronically, primarily with Sunpass transponders. The lanes flow eastbound on weekends and from 4 am to 1 pm and on week days and westbound week days from 2 pm to 2 am. Toll rates vary depending upon traffic congestion. Interstate 595 was approved by AASHTO on October 28, 1978 for the portion of the Port Everglades Expresway between U.S. 441 and State Road A1A near Fort Lauderdale-Hollywood International Airport (FLL). 1985 – Construction began on Interstate 595. 1988 – The first section of Interstate 595 opened from Interstate 75 east to Pine Island Road. 1989 – Interstate 595 opened from S.W. 26th Terrace east to U.S. 1, which was realigned near Fort Lauderdale-Hollywood International Airport. 1990 – Interstate 595 opened from Pine Island Road east to S.W. 26th Terrace. Interstate 595 is now complete. 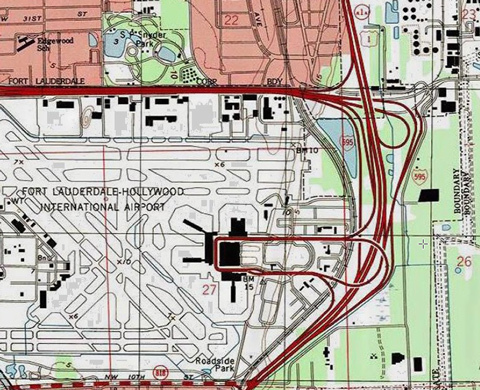 USGS Topographic Map showing the former ramp configuration between U.S. 1 and Fort Lauderdale-Hollywood International Airport (FLL). An array of retention ponds aid in the drainage of storm water throughout the four-level interchange joining Interstate 595 with I-75 and SR 869 (Sawgrass Expressway). Photos taken 03/26/06. The I-595 Express Lanes eastbound at Florida’s Turnpike (Exit 8). Photo taken 04/01/14. 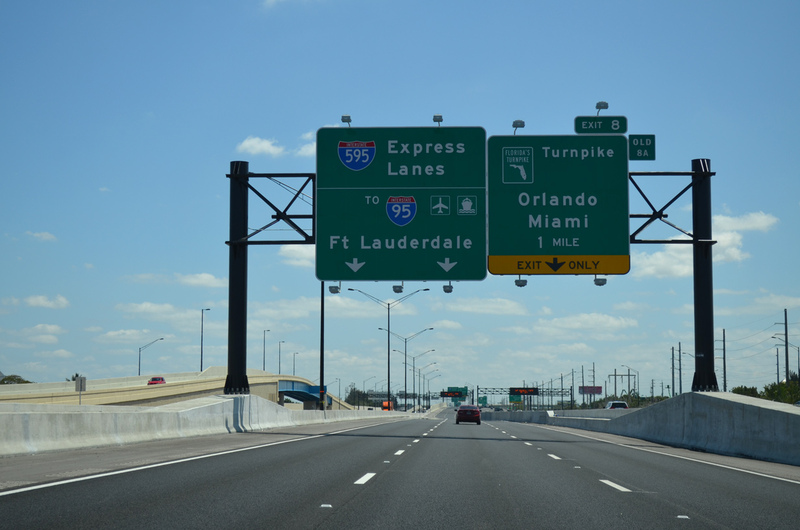 The lone off-ramp of the I-595 Express Lanes links eastbound with Florida’s Turnpike. There are no exits westbound. Interstate 595 travels an eight lane viaduct along the northern periphery of Fort Lauderdale-Hollywood International Airport (FLL) to Exits 12A/B with U.S. 1 (Federal Highway) at Port Everglades. A two-lane ramp leaves the viaduct end for both U.S. 1 south to Dania Beach and the airport passenger terminal. Photo taken 12/23/13. Passing below U.S. 1, Interstate 595 comes to an end at the loop ramp (Exit 12B) onto U.S. 1 north into Downtown Fort Lauderdale. Photo taken 04/01/14. A left exit takes drivers to NE 7th Avenue and Port Everglades via Eller Drive. Construction though late 2014 added the flyover for Eller Drive over railroad tracks built for the Intermodal Container Transfer Facility at the port. Photo taken 01/24/16. Interstate 595 ended previously with four options. Exit 12A departed for U.S. 1 south while Exit 12B was a separate ramp for Fort Lauderdale-Hollywood International Airport (FLL). The mainline split between Exit 12C onto U.S. 1 north into Fort Lauderdale and Eller Drive east into Port Everglades. Photo taken 01/00. The separate ramp for U.S. 1 south was eliminated by 2003, with both movements to the US route and airport terminal consolidated into a new ramp. A new end sign was also added during the construction project. Photo taken by Justin Cozart (06/03). The sign for Exit 12B was unveiled by July 2003 to show the reconfigured two-lane ramp for U.S. 1 south and the airport. The former ramp to U.S. 1 was demolished. Photo taken by Jim Teresco (07/03). A second end shield for Interstate 595 was posted at the Exit 12B gore point. Photo taken by Justin Cozart (06/03). The scene where Interstate 595 partitioned with Exit 12C to U.S. 1 north and Eller Drive east to Port Everglades remained unchanged until 2012, when work broke ground to construct a new flyover from U.S. 1 north to I-595 west. Downtown Fort Lauderdale is two miles to the north and U.S. 1 continues beyond to Pompano Beach in nine miles. Photo taken 03/25/06. The end shield for I-595 was initially posted at Exit 12C. Cluttered text was used on the older U.S. 1 north overhead as well. Photo taken 01/00. NE 7th Avenue parallels the U.S. 1 expressway east of the airport to Eller Drive and the westbound beginning of Interstate 595. Photo taken 04/01/14. U.S. 1 curves northeast from NE 10th Street and Griffin Road to pass under runways of Fort Lauderdale-Hollywood International Airport (FLL) on the half mile approach to the split with Interstate 595 west. Photo taken 01/24/16. Northbound U.S. 1 maintains three through lanes to Federal Highway toward Downtown Fort Lauderdale as a trumpet interchange joins the route with I-595 (Port Everglades Expressway) west and NE 7th Avenue and Eller Drive east to Port Everglades. Photo taken 01/24/16. A two wye directional interchange originally joined U.S. 1 with the passenger terminal of Fort Lauderdale-Hollywood International Airport (FLL). Changes were later made, adding a loop ramp from southbound to the airport. This photo looks at the former configuration exiting the airport. Photo taken 01/00. U.S. 1 upgrades to a controlled access route between SE 30th Street and State Road 818 on the south side of Fort Lauderdale-Hollywood International Airport (FLL). A trumpet interchange joins the US highway with Interstate 595 opposite Eller Drive to Port Everglades. Photo taken 03/04/14. The ramp to Interstate 595 west departs U.S. 1 south ahead of the Port Everglades Expressway interchange with I-95. A second off-ramp follows and joins the I-595 eastbound exit to the airport terminal. Photo taken 03/04/14. 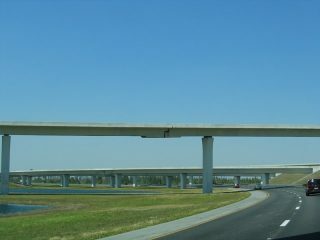 The I-595 Express Lanes split with a slip ramp onto the Interstate 595 westbound mainline ahead of the one mile approach to Interstate 75 and Florida 869 (Sawgrass Expressway). Photo taken 04/01/14. The I-595 Express Lanes continue to ramps with Interstate 75 south to Miami and north to Naples. The freeway mainline expands to six lanes. Photo taken 04/01/14. A high speed flyover combines with a slip ramp from the ending I-595 Express Lanes to join Interstate 75 southbound for the Miami suburban communities of Weston, Miramar, and Palm Springs North. Photo taken 04/01/14. 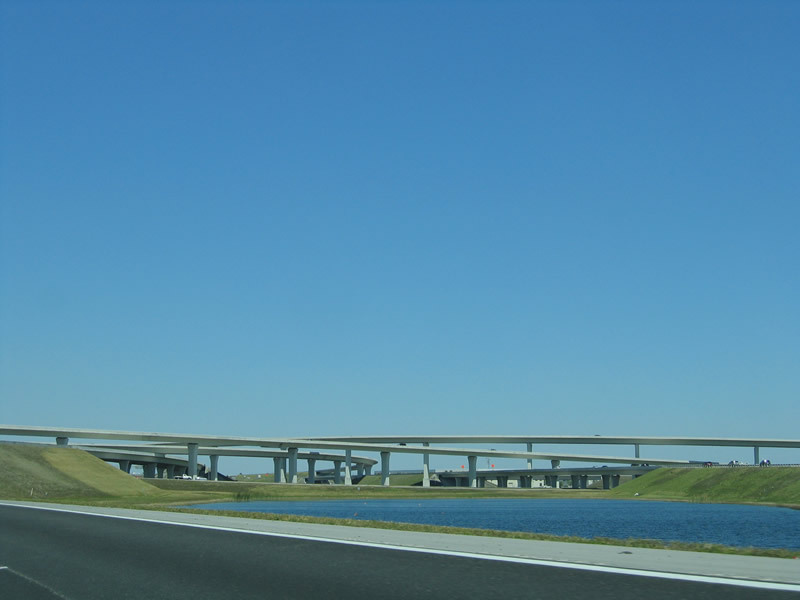 The remaining four lanes of Interstate 595 west diverge as ramps for Interstate 75 north across Alligator Alley and State Road 869 north to Sunrise. A final off-ramp leaves from the I-75 north connection for Florida 84 west to Weston. Photo taken 03/04/14. One mile east of Interstate 75 and the Sawgrass Expressway north on I-595 west. A single sign referenced all the upcoming movements. Photo taken by Justin Cozart (06/03). Flyovers between Interstates 595 and 75 and the Sawgrass Expressway came into view as traffic partitioned to Hialeah, Naples and Coral Springs. Photo taken by Justin Cozart (06/03). Traveling from I-595 west to I-75 north, before the addition of the SR 84 off-ramp to Weston. Photo taken by Justin Cozart (06/03). Looking northward at ramps to the Sawgrass Expressway. State Road 84 west travels below. Photo taken by Justin Cozart (06/03). Nearing the Weston Road underpass, a sign advises motorists of the March 2014-opened I-595 Express Lanes. The Express Lanes split from the I-595 mainline from within the stack interchange with I-75 and SR 869. Photo taken 04/01/14. New signs were installed for Exit 19 between December 2013 and March 2014 to reference the change of tolling on the Sawgrass Expressway. Cash tolls are no longer collected on the 21.24-mile toll road. Instead tolls are paid using Sunpass transponders or toll by plate. Photo taken 04/01/14. Painted shields accompany overhead guide signs as the southerly turn of Interstate 75 toward Hialeah. Interstate 595 (Port Everglades Expressway) takes over the eastern trajectory of I-75 en route to Fort Lauderdale and Fort Lauderdale-Hollywood International Airport (FLL). Photo taken 04/01/14. Exit 19 partitions into separate two lane ramps for Florida 869 (Sawgrass Expressway) north to Sunrise and Coral Springs and Interstate 595 east to Davie and Plantation. I-595 Express Lanes split from the freeway beginning just ahead, offering a relatively uninterrupted drive to Interstate 95. Photo taken 04/01/14. Five miles east from the end of Alligator Alley along I-75 southbound on the approach to I-595 east and SR 869 (Sawgrass Expressway) north. Interstate 75 resumes a north-south trajectory for the bulk of its final 19 miles to the Palmetto Expressway. Photo taken by Justin Cozart (06/03). Three lanes for Exit 19 departed the I-75 mainline for Interstate 595 east and SR 869 north. I-595 travels 11.8 miles to the east to meet Interstate 95. The Sawgrass Expressway travels 17 miles northeast to Deerfield Beach and Florida’s Turnpike. Photo taken by Justin Cozart (06/03). Older guide signs for the Sawgrass Expressway referenced West Palm Beach for the connection with I-95 north. SR 869 ends as a toll road just east of Florida’s Turnpike, with an arterial section continuing to I-95. Photo taken by Justin Cozart (06/03). Interstate 75 lines eastern reaches of Weston to Exit 19 with Interstate 595 (Port Everglades Expressway) east and Florida 869 (Sawgrass Expressway) north. Photo taken 04/01/14. Curving eastward, Interstate 75 enters the city of Sunrise on the half mile approach to Exit 19. The Sawgrass Expressway extends northward from I-75 and I-595 through western Sunrise, Tamarac and Coral Springs, separating urban areas to the east from the Everglades to the west. Photo taken 04/01/14. 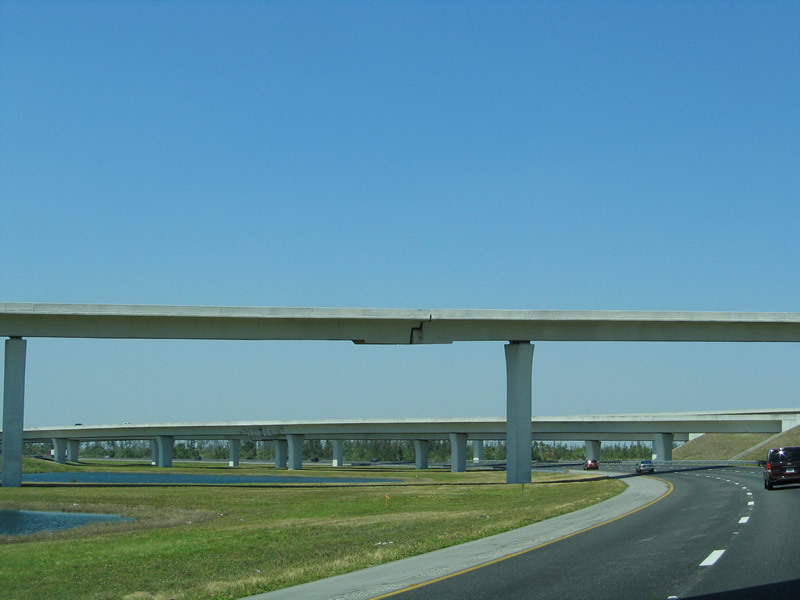 Alligator Alley appears for Interstate 75 north, referencing the toll road across the Everglades and Big Cypress National Preserve to Naples and Southwest Florida. Painted shields aid in separating traffic to I-595 east and SR 869 north as well. Photo taken 04/01/14. Two lanes leave the Sawgrass Expressway beginning for Interstate 595 east to Davie and Fort Lauderdale. Drivers taking Interstate 595 immediately partition with the I-595 Express Lanes. Photo taken 04/01/14. 1.5 miles south of Exit 19 with Interstate 595 east and Florida 869 north on I-75 north at the Royal Palm Boulevard trumpet interchange. This wider guide sign was replaced with a smaller panel between May and June 2008. Photo taken 03/26/06. A dynamic message board separated panels for the Sawgrass Expressway and Interstate 595 east (Exit 19). Both exits depart from the right one half mile north of the SW 14th Street overpass. Photo taken 03/26/06. Interstate 75 northbound widens to six lanes ahead of Exit 19 with I-595 east and SR 869 north. The left three lanes continue I-75 north westward, while the right three lanes transfer traffic onto I-595 and the Sawgrass Expressway. Florida 869 heads north six miles to Coral Springs. West Palm Beach, 45 miles to the north, was referenced for the SR 869 connection with Florida’s Turnpike. Photo taken 03/26/06. 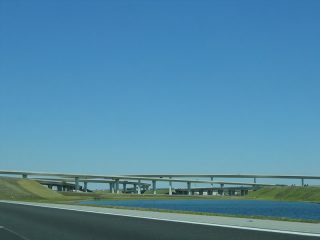 The Sawgrass Expressway southbound defaults onto Interstate 75 southbound for the approximately 30 mile drive to Miami. A two-lane flyover emerges to the right for Interstate 595 east. Photo taken 03/25/06. Traffic to Interstate 595 east to Fort Lauderdale and Port Everglades departs Florida 869 south. A second flyover follows in one half mile for Interstate 75 north to the Florida Gulf Coast. Photo taken 03/25/06. Passing over SR 838 (Sunrise Boulevard), one mile north of the junction with Interstate 75 and 595 east on SR 869 south. Photo taken 01/00. Florida’s Interstates: A Half-Century of Progress. http://www.fl-interstate.com official Florida Department of Transportation site.